As the summer heats up in the arid parts of the country, fire safety should be on everyone's mind. Even in areas where fires are less common, it's good to make a yearly evaluation of everything that can be done inside and outside the home to prevent a fire. Fire is not something most people spend a lot of time thinking about. However, when you are making upgrades to your house, take the time to consider what you can do to prevent fires from occurring and to minimize the damage to people, pets and property if they do occur. Construction materials vary widely in their flammability. Building codes are designed with fire safety in mind, but you can go above and beyond by using the most fire-resistant materials. Insulated concrete foundations (ICF) create an ultra-fire safe base for a home, especially if something other than wood is used for the remainder of the house. Stucco or brick is a great choice for the exterior, but cement fiber board siding is also very fire resistant and gives the look of natural wood siding. Finally, consider metal for the roof. It's completely inflammable and is also quite trendy. Space heaters, fireplaces, stoves, and furnaces are often the source of ignition for a home fire, so it pays to take the extra steps to make them as safe as possible. For new construction, this means investing in quality products and hiring trained professionals to install then for you. A DIY approach is not necessarily a good idea when it comes to things that are a potential source of ignition. Also, make sure to educate everyone in the house on how to use heat sources safely, especially children. For example, never place space heaters against the wall, drapes, piles of clothing, or other flammable materials. Likewise, train your kids to put a lid on skillets with hot oil, which can easily ignite if it splatters into an open flame. Finally, maintenance is critical for safe operation of some heat sources, especially woodstoves and fireplaces. Hire a chimney sweep to clean the flue and confirm that everything is good working order before making the first fire each fall. 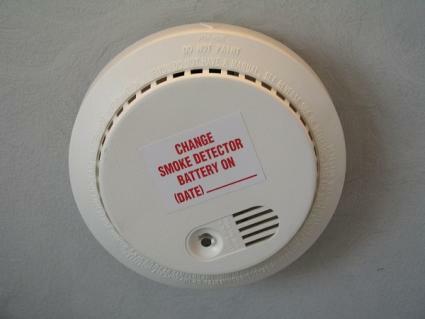 Testing your fire alarms twice a year is a good practice to adopt. You may also want to consider a direct notification alarm, which automatically alerts the fire department when a fire is detected in the house. One of the ultimate safety features is an indoor sprinkler system. These are typical in commercial buildings, but there are systems designed for residential applications, as well. When the fire alarm goes off, the sprinklers come on, making it difficult, if not impossible, for flames to spread. There are also little things that you can do to prevent harm in the case of an actual fire. Have a meeting with your family to discuss possible escape routes from different parts of the house. For multi-story homes, you may want to buy a folding fire ladder for escaping from second story windows. Teach your kids basic fire safety tips, such as stop, drop and roll if your clothing catches on fire. Outdoor fire prevention is equally important. In arid places, fires can move from forested areas to residential areas, causing catastrophic damage and taking lives. There are also many common hazards in the home landscape that can lead to fires starting in the yard and then spreading to the house, or adjacent natural areas. Large conifers next to the house are a fire hazard. Some plants are highly flammable and should not be planted next to the house in fire prone areas. 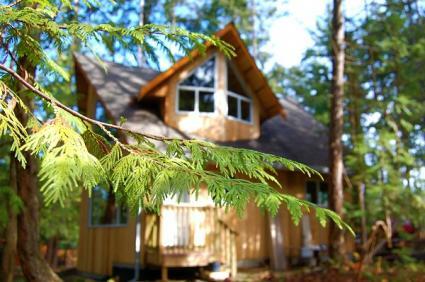 These include eucalyptus, juniper, pines, and other conifers. In general, species with thick and aromatic sap, papery bark or a tendency to accumulate a lot of dried twigs and leaves should be avoided. Conversely, there are alternative species that are quite fire resistant. Plants with large, lush leaves and little to no accumulation of dry, dead material are the safest. Examples include maple trees, rhododendron, and succulents. In general, a lush, well-irrigated landscape is less fire prone that one that is comprised of spindly drought-tolerant plants. If your home landscape includes naturalized areas, take the initiative to prevent the build up of combustible fuel. This includes mowing dry weeds and grasses, removing the dead lower limbs on trees, and clearing out dense brushy vegetation. The less combustible material there is at ground level, the better. 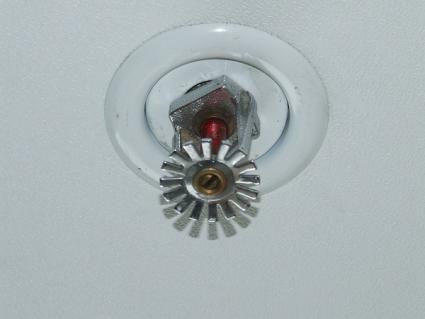 Roof-mounted sprinkler systems are the ultimate in outdoor fire protection. These function much like a sprinkler system for your lawn, but they are designed specifically to prevent the house from catching fire in the event of wildfire. At the very least, keep a collection of hoses and ordinary lawn sprinklers on hand if you live in a fire prone area so you can set them up and leave them running if you are forced to evacuate. Flammable chemicals, such as gasoline, oil, paint, and solvents should be stored in a secure location that is inaccessible to children. They are usually safe when they are in their original container, but it's important to prevent accidental spills because there are many things that can cause them to ignite, from cigarette butts to a barbecue grill to a spark from an electric tool. An often overlooked source of combustion outdoors occurs with rags that have been used with oil-based stains, varnishes, and other such products. If piled together, oil-stained rags can spontaneously combust and cause other objects to catch fire nearby. There are various procedures for safely disposing of oil-stained rags, but if you need to store them temporarily while engaged in a woodworking project, place them in a metal pail with a closed lid. If you're going to use any source of fire in the landscape, such as a barbecue grill, fire pit, or tiki torches, take basic precautions to ensure that the flames do not ignite other objects in the landscape. Do not use them underneath overhanging limbs, for example, or during high winds. The best place to use these fire features is on a level, non-combustible surface with a large open space around them. A lawn, gravel pad, or paved area are all good choices. Central to outdoor fire prevention is the concept of defensible space. In essence, this means creating an outdoor environment with a minimum of fire hazards. In fire-prone states like California, there are legally defined standards for defensible space that relate to vegetation management similar to what was described above. A landscape that is defensible doesn't have piles of brush underneath trees or stacks of lumber next to the house, for example. Part of what makes the space around your home defensible is being open and accessible to fire fighters. Large paved areas and lawns, though they may be undesirable for other reasons, make it easy for firefighters to to protect the home because they can easily maneuver their equipment in an area with few flammable objects. Finally, it's important that your address be clearly visible from the road so fire crews can find you once 911 is called. House fires are like a car accidents - the tiniest mistakes can cost lives. You only get one chance to do everything right, so put the time aside and make a checklist of everything that can be done to improve fire safety around your home.